A study of more than one million Swedish military draftees published last week in JAMA Psychiatry suggests heightened heart rate and blood pressure at age 18 may be associated with higher levels of psychiatric disorders later in life. 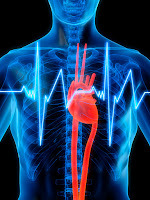 The highest risk from an elevated resting heart rate in late adolescence was found for obsessive-compulsive disorder (OCD); men with resting heart rates above 82 beats per minute had a 69 percent increased risk for OCD compared with those with heart rates below 62 beats per minute, wrote Antti Latvala, Ph.D., of the Karolinska Institutet and the Department of Public Health at the University of Helsinki and colleagues. In addition to being at a higher risk of developing OCD later in life, men with resting heart rates above 82 beats per minute had a 21 percent higher risk for schizophrenia and an 18 percent higher risk for anxiety. Analysis of blood pressure measurements from the group revealed an association between higher diastolic blood pressure and increased risk of anxiety, OCD, and schizophrenia. The study also found that a lower resting heart rate was associated with substance use disorders and convictions for violent crimes. “Increased heart rate is seen in many psychiatric disorders, but showing that increased heart rate predicts obsessive-compulsive disorder, anxiety disorders, and schizophrenia is very original,” Ranga Krishnan, M.B., Ch.B., dean of Rush Medical College in Chicago, and who was not involved in the study, told Psychiatric News.